BANKEX, a leading global fintech company, and Codex Protocol, a decentralized registry for unique assets, have partnered to establish an end-to-end solution to securitize valuable collectibles. The partnership is an exciting opportunity to provide more liquidity to collectors and more investment opportunities for capital-providers which, in turn, will lead to further securitization while preserving the privacy of both — something financial markets and individuals increasingly demand. According to BANKEX CEO, Igor Khmel, while Codex stores unique assets’ identity securely on blockchain as a Codex Record, BANKEX will develop a security token exchange based on the Codex Protocol ledger for trading unique assets. The exchange will enable the possibility to buy fractional ownership of assets in the Art Collectibles asset class. 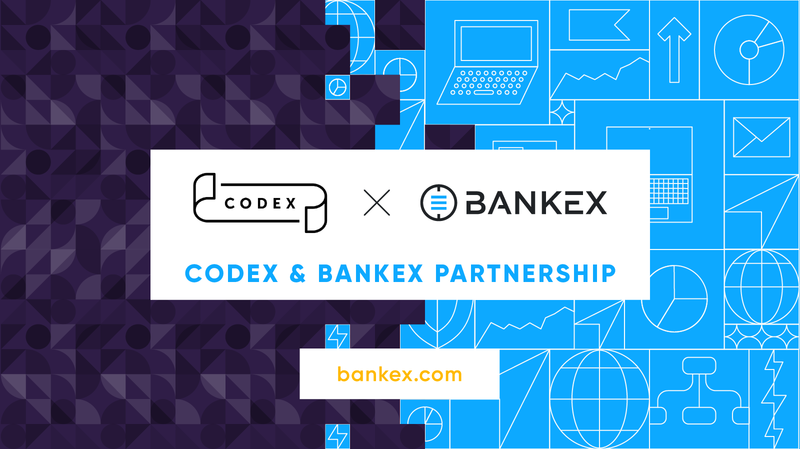 “Adding Codex as a partner is part of BANKEX’s strategic effort to establish security tokenization standards in a number of industries. We are already doing this with MovieCoin, with music rights and REIT tokenization also in the pipeline. Each asset class requires building relationships with major asset providers — Codex has relationships with global art auction houses — and $100M+ security token underwriting capability. To facilitate the latter, BANKEX is building technical connection with leading global investment firms and brokers.” – Igor Khmel, CEO, BANKEX. Codex Records represent unique assets and contain the validated, critical information that gives them value and enables them to be valued. Tokenization of art and collectibles from Codex through BANKEX will be extended to the Codex Viewer through this partnership. The BANKEX Proof-of-Asset protocol (PoA) is a standard that enables a new generation of assets and contracts that together create Decentralized Capital Markets. The protocol facilitates digitization, tokenization, and exchange of real assets using a combination of various smart contracts individually engineered for each type of asset. BANKEX’s mission is to add liquidity to assets that may be undervalued due to the way that traditional financial markets currently operate. The $2 trillion A&C asset class presents a perfect opportunity for the BANKEX solution. Providing the identity, chain of ownership, and other metadata about an item to determine its provenance, and verifying this critical information within a trusted ecosystem eliminates the constant and costly challenges for accessing services for arts and collectibles, an industry that is ready for transformation. Owners of assets using Codex and BANKEX will have exciting new access to liquidity, which will provide opportunities to add to and maintain the value of their collectibles assets. BANKEX is a global top-50 fintech company developing the Proof-of-Asset Protocol to bring Banking-as-a-Service (BaaS) product modules and blockchain together to enable digitization, tokenization, & exchange of assets for the development of a tokenized global ecosystem. Leading BANKEX technologies include the Proof-of-Asset Protocol for tokenization, Plasma Protocol, BANKEX Scan, BANKEX Smart Justice, BANKEX Trust Service, and the Solidity Floating Point Library. Codex is the leading decentralized asset registry for the $2 trillion arts & collectibles (“A&C”) ecosystem, which includes art, fine wine, collectible cars, antiques, decorative arts, coins, watches, jewelry, and more. Powered by the CodexCoin native token, the Codex Protocol is open source, allowing third-party players in the A&C ecosystem to build applications and utilize the title system. Codex has launched two initial decentralized apps (beta), Biddable, providing access to unique assets for crypto-holders, and Codex Viewer, to create and manage blockchain identities for your unique assets. The Codex Protocol and CodexCoin will be adopted as the only cryptocurrency by The Codex Consortium, a group of major stakeholders in the A&C space who facilitate over $6 Billion in sales to millions of bidders across tens of thousands of auctions from 5,000 auction houses in over 50 countries.